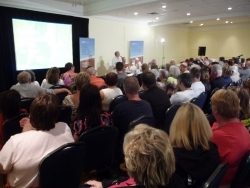 HALIFAX—A standing-room-only crowd packed a Halifax meeting room on a summer night to hear about a secret. Two national speakers, Maude Barlow of the Council of Canadians and Canadian Union of Public Employees (CUPE) President Paul Moist, provided a harrowing account of the Harper government's "trade" negotiations with Europe that they said will transfer decision-making power from local governments to multinational corporations. The vehicle for this wholesale corporate power grab is the Comprehensive Economic and Trade Agreement (CETA), said the speakers. Unlike the earlier Free Trade Agreement and North American Free Trade Agreement, CETA would reach into provincial and municipal policy-making and purchasing, Moist said. It would seriously threaten local job creation and "Buy-Local" policies; it would encourage privatization of Canada's drinking water and waste-water services (no matter what local citizens wanted); and it would cause prescription drug costs to skyrocket by at least $2.8 billion per year. CETA is essentially a corporate bill of rights which puts companies and their profits first and the wishes of local citizens last, said Barlow. For example, European corporations could seek compensation for business lost as a result of any government regulation or policy. This includes banning a carcinogenic additive to gasoline (this has already happened under existing "trade" deals) or paying millions to a pulp and paper company that abandoned Newfoundland and Labrador. "We have nothing against trading with Europe and much of our trade is now free or becoming free of tariffs," said Moist. "But this deal goes well beyond trade issues into interfering with how local people can make decisions about how to run their communities." A Nova Scotia speaker, Mark Austin, Executive Director of the Rural and Coast Communities Network, added a number of concerns. "This deal has huge implications for Nova Scotia, particularly rural areas, yet we have heard nothing about it," Austin said. It would likely result in overfishing, and would threaten food sovereignty through attacks on agricultural policies such as farm marketing boards, he added. And buy-local initiatives, like one Austin is involved with in Truro, could become impossible. "While there might be small short-term gains in trade with Europe, you have to give up control of your long-term local economic prospects. It's like the Canucks playing in Boston—you can score one goal, but you have to give up five." CUPE Nova Scotia President Danny Cavanagh, who chaired Tuesday's event, said CETA negotiations would resume in Brussels on July 10. Prime Minister Harper hopes to sign a completed deal by the end of the year. Premier Darrell Dexter and other provincial premiers, who also need to sign off on the deal, are part of Canada's little-publicized discussions. Barlow said that while it may be unrealistic to expect a provincial government not to sign the agreement, she hopes that public pressure motivates premiers to drive a harder bargain and seek exemptions from the most damaging aspects of the currently proposed deal. Despite the devastating potential impact, the speakers noted that the Nova Scotia government has done nothing to alert citizens of what is at stake. Moist said that the Nova Scotia and Manitoba governments have agreed to talk in private with CUPE and the Council of Canadians research staff about the negotiations, but no consultations with the general public are planned. The European Parliament receives regular status reports in public on the CETA negotiations, Moist said. "Why can't Canadians get such reports?" Dartmouth MP Robert Chisholm, the federal NDP trade critic, was at the meeting, as was Halifax NDP MP Megan Leslie. No provincial politicians attended. "It's not too late to stop the deal," Barlow said. The speaking event was part of a national campaign entitled, "Canadian communities are not for sale.” More information is available as part of a “CETA toolkit” at http://cupe.ca/ceta, or at www.canadians.org. This article was originally published with the Halifax Media Co-op. Jim Guild, of Halifax, recently retired from a staff rep. position with the NS Government and General Employees Union (NSGEU) and has been active of late with the Halifax Media Co-op. Submitted by Anthony_E on Tue, 2011-08-02 12:35. I think many people believe that prior evidence has shown that when the government gets too involved things go south and they head that way quickly. I think the same can be said for "going global." Le slot machine di un casino online possono "raffreddarsi" allo stesso modo di quelle di un normale casino online aams, quindi assicurati sempre di star seguendo il gioco con attenzione.